Here’s a quarter turn stair with winders project, built by Dominique, an amateur wood worker, using our StairFile Pro service. The Pro version of this service includes a complete revision of the working plans as well as personal coaching all through the building of the stair. It has enabled Dominique to build this complex and beautiful first time stair. After this long silence, I’m writing to to tell you that my stair is installed. Your advice and coaching to set up the plans and all through the build of this project has made it a complete success! I’ve taken quite some time, lots of shavings ( I started from rough cut ash, straight fro the lumber yard) and quite some thinking it out to get it all together. As I didn’t have the possibility to print out full size templates I used DraftSight to dimension the plans, a big job for me, but the final result was well worth it. Especially when the stair was at last installed on site! And also especially as the site was 500km from my workshop, so no question of going back to take a missing dimension! But everything worked out fine, just as planned, including the installation that I did all by myself! Thanks again, Ness for you help, advice and support, without which I doubt I would have been able to get through this project. I’ve learned a lot thanks to you and StairDesigner and building a quart turn stair with winders is an ambitious project for an amateur wood worker like myself. I’ve taken lots of photos while making this stair, and if you want to show other amateurs what can be done with StairDesigner and your StairFile service please feel free to publish them on your website. To see more of Dominique’s photos click this link. 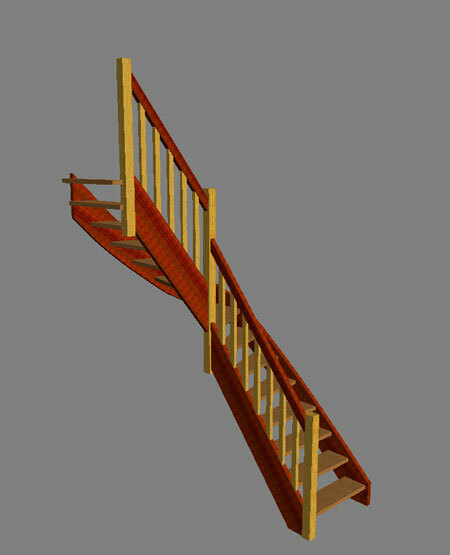 You can also download the StairDesigner files for this project by clicking here.